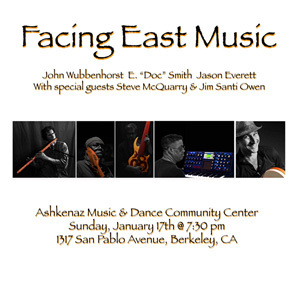 Doc has been performing and recording with his Zendrum EXP; Performing in February with the Deep Energy Orchestra, bassist Jason Everett’s group, featuring Selvaganesh Vinayakram, Trey Gunn, Fareed Haque, Phil Hirschi, Radhika Iyer, Rachel Nesvig, Aleida Gehrels, Chaz Hastings, and the Seattle Metropolitan Chamber Orchestra; with bansurist John Wubbenhorst’s “Facing East” , featuring Tom Canning and Steve Zerlin; with Steve McQuarry's, “Echelon”, featuring 2 members of his Resonance Jazz group: Ted Burik and Michele Walther; with flautist Laura Austin Wiley's Electric Quintet, with guitarist David McFarland, bassist Edo Castro, and keyboardist Jim Lang; with guitarist Peter McKibben’s “FutureJazz”… Doc is also working in Steve McQuarry’s new Organ Trio with David McFarland. "Facing East Duo with John Wubbenhorst"
"John Wubbenhorst and Facing East"
“World Music Concert with John Wubbenhorst"
"John Wubbenhorst and Facing East, featuring Jason Everett & Steve McQuarry"
"Facing East Music with John Wubbenhorst, Jason Everett and Samrat Kakkeri"
"John Wubbenhorst and Facing East, featuring Jason Everett & Samrat Kakkeri "
"New World Street Players with Al Lazard, Craig Kleinman, Sara Remington and Gary Zellerbach"
"John Wubbenhorst and Facing East, featuring Steve McQuarry & Edo Castro"
"The UF2: The Unidentified Flying Duet"
Opening reception for exhibition of photos taken by David DeVries during the 2006-2008 demolition of the Hunters Point Power Plant and other artwork of monumental architecture, adaptive reuse, and urban detritus. Please join us at the Royce Gallery for our first ever benefit show. We are proud to feature cutting edge acoustic and MIDI pioneers in music and tap dance. Doc is performing Friday, October 28th at 12:30 pm with the Wilbur Rehmann Quartet, featuring Wilbur Rehmann on soprano & tenor sax, Sam Peoples on piano and Ariane Cap on acoustic & electric bass at the Cadillac Hotel, 380 Eddy Street, San Francisco. The admission is free. Doc is performing Sunday, October 9th at 11:30 am with Steven Ellison on guitar, vocals & Chapman Stick, Jim Lang on piano & accordion, Kerry on violin and Eric Dahlman on trumpet at the Unitarian Church, Pasedena. The admission is free. “E. Doctor Smith & Edo Castro”Doc is performing Saturday, August 6th at 7:00 pm with bass virtuoso Edo Castro with special guests, utilizing the generative software of Brian Eno at the Royce Gallery, 2901 Mariposa Street, San Francisco. The admission is $10. 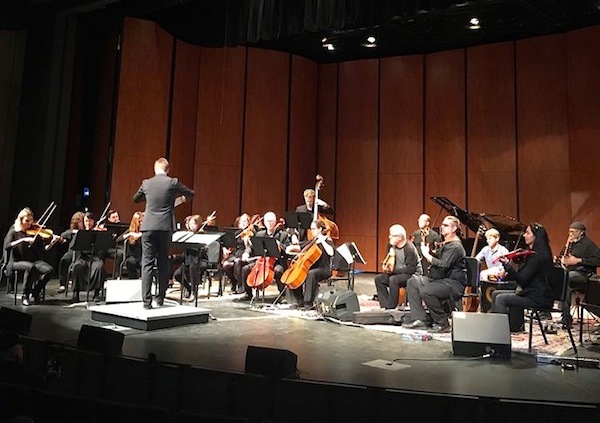 Doc is performing Sunday, June 12th at 3:00 pm with the original UFQ, featuring saxophonist Charles Unger, keyboardist Sam Peoples and bassist Mike Shea at the Bayview Opera House, 4705 Third Street, San Francisco. The admission is free. Doc is performing Wednesday, May 25th at 7:00 pm with tap dance Queen, Rosie Radiator at the Royce Gallery, 2907 Mariposa Street, San Francisco. The admission is $25. Doc is performing Friday, March 8th at noon with saxophonist Charles Unger, guitarist John Moremen and bassist Ariane Cap with special guest Alison Levy on piano at the Cadillac Hotel 380 Eddy Street, San Francisco. The admission is free. 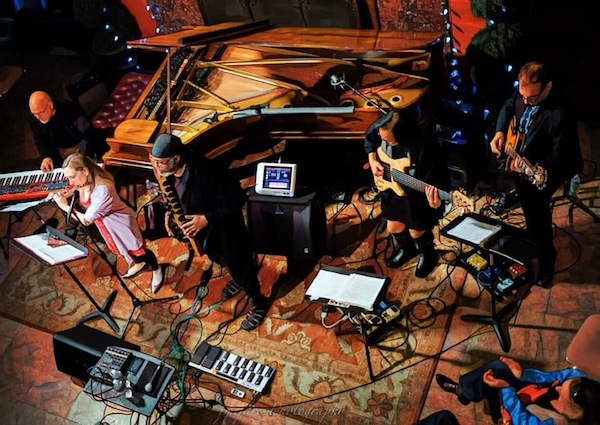 Doc is performing Saturday, February 26th at 7:00 pm with the UFQ, featuring saxophonist Charles Unger, keyboardist Nora Maki and bassist Mike Shea at the Bayview OIpera House, 4705 Third Street, San Francisco. The admission is free. Doc is performing Thursday, January 26th at noon with saxophonist Charles Unger as The UF2: The Unidentified Flying Duet at the Mission Health Center, San Francisco. The admission is free. Doc is performing Thursday, September 16th at 3:00 pm with the original UFQ, featuring saxophonist Charles Unger, keyboardist Sam Peoples and bassist Mike Shea at the Cadillac Hotel 380 Eddy Street, San Francisco. The admission is free. Doc is performing Friday, August 20th at noon with keyboardist Sam Peoples as The UF2: The Unidentified Flying Duet at the Cadillac Hotel! 380 Eddy Street, San Francisco. The admission is free. Doc will be sitting in with the Wilbur Rehmann Quartet: Special Edition, featuring Wilbur Rehmann on sax, Edo Castro on bass and Sam Peoples on keyboards at the Fillmore Jazz Heritage Center's Lush Life Gallery Sunday, August 8th @ 2:00 pm! Sam Peoples is an accomplished jazz pianist whose family, including the world renown band leader Wes Peoples, have long been part of San Francisco's Fillmore jazz history, having performed with the likes of John Coltrane, Vernon Alley and Miles Davis among others, and featured in the great book "Harlem of the West: The San Francisco Fillmore Jazz Era". Sam has performed and recorded with a who's who of Bay Area musicians and is a member of both the UFQ and the Charles Unger Experience. “Soul Adobo” Edo Castro is a multi-stringed bass virtuoso. Castro has performed with a plethora of jazz greats; Roy Haynes, Ed Thigpen, Johhny Griffin, Armando Peraza, Stu Hamm and Mark Egan, just to name but a few. E. "Doctor" Smith is a drummer and percussionist who has worked with the likes of Brian Eno,Madonna, Warren Zevon, Mickey Hart, Jimmy Cliff, and John Mayall among others. He is the inventor of the musical instrument, the Drummstick. He is thrilled with his recent collaboration with bassist Edo Castro. Performing "chamber music for the new millennium" this virtuoso trio has been astounding audiences for the last ten years with their amazing chops, quiet soul and diverse compositions. With over 100 albums to his credit, bass phenom Michael Manring has been hailed as "the world's greatest electric bassist" while pianist Tom Darter's compositions have drawn praise from Elliott Carter, Aaron Copland and Karel Husa and music critics have compared Kassin's flute playing with Rahassan Roland Kirk, Hubert Laws and Paul Horn. While listeners can hear echoes of classical, folk, avant-garde, and world music in their performances, the net result is music that tears down stylistic walls and refuses to be compartmentalized. Opening this evening is Edo Castro with E. "Doc" Smith. Edo Castro is a multi-stringed bass virtuoso. Castro has performed with a plethora of jazz greats; Roy Haynes, Ed Thigpen, Johhny Griffin, Armando Peraza, Stu Hamm and Mark Egan, just to name but a few. E. "Doctor" Smith is a drummer and percussionist who has worked with the likes of Brian Eno,Madonna, Warren Zevon, Mickey Hart, Jimmy Cliff, and John Mayall among others. He is the inventor of the musical instrument, the Drummstick. He is thrilled with his recent collaboration with bassist Edo Castro. 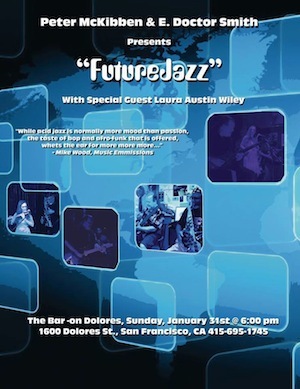 Larry Kassin (flute) founded the internationally recognized Noe Valley Music Series in 1981, at the acoustically superb Noe Valley Ministry in San Francisco, California. His wide-ranging performance style has led to appearances with Bobby McFerrin, Jessica Williams, SF Klezmer Experience, Rhiannon, Sonia, and Box Set, plus a recent CD release with Doors keyboardist Ray Manzerek and Beat poet Michael McClure. Tom Darter (piano), founding editor of Keyboard magazine, established the Contemporary Music Ensemble at the Chicago Musical College of Roosevelt University, where he also taught music theory and composition. He has arranged two albums of music for the Kronos Quartet Monk Suite (Music of Bill Evans), played keyboards on numerous Jerry Goldsmith film scores, and won several composition awards.